Anthropologie has done it again. 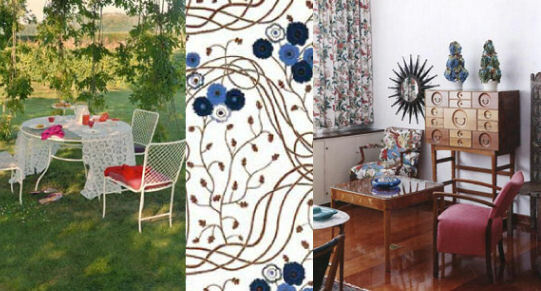 This season, they are dazzling me with this botancial beauty, the Josef Frank wingback. Mmmm. I'm also a big fan of the Glass Menagerie glassware (they strangely remind me of Inke silhouettes) and this funky macrame-inspired jute doormat. It looks like something my mother would have owned back in the 70's because she loved to macrame. Although the chair is out of my league (it's $2,500-), the price somewhat makes sense because Josef's textiles are expensive off the bolt, I imagine half the expense of this chair is based on the fabric alone. I suggest purchasing the fabric alone from Svenskt Tenn (online, based in Sweden) and use it for smallish projects - cover a bench, seat, a fabric blind, etc. 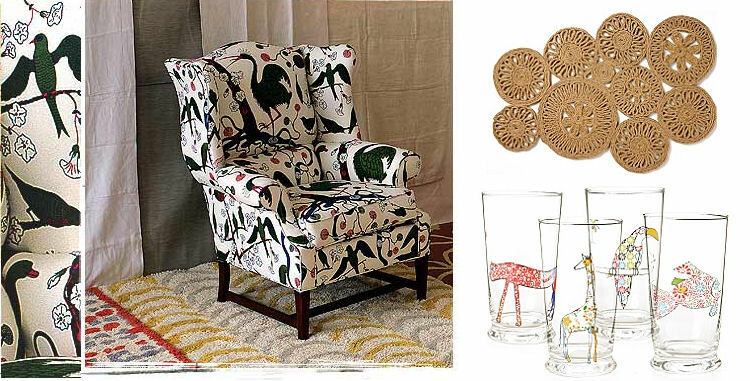 The linen shown on the chair above, Gr?na f?glar (does that mean green bird? ), is $171- USD per meter. With tax and shipping to the states, one meter will cost you (gulp) around $338.00 USD. (Use this handy currency coverter as you're shopping their site.) The prices shown are in Swedish Kroners. Maybe you can go in with a friend or two on a purchase and split the expense?